Spirit & Place Festival always has always chosen interesting and relatable themes – ones that tie to many different facets of our lives. And this year’s theme, HOME, is even more relevant to me than most, as I am a musician and feel a very deep connection between music and my sense of place. And I’ve somewhat recently dedicated myself to serving Indiana musicians through my job as Executive Director at Musical Family Tree. So for this post, I want to take the opportunity to discuss the importance of celebrating the amazing musicians in your home city. Bloomington band, Brenda’s Friend, at Indy CD & Vinyl. Photo credit to Adan Orona. For just about everyone, your childhood hometown is probably the most transformational place in your life. When you’re young, this is the first city in which you learn to make lifelong friends, discover the hobbies and interests that you pursue through adulthood and find a community of people who support you and who shape you. The very same goes for bands and the cities they start in. The relationships they make, the support they do or do not find, and the skills they develop early in their formation impact the entirety of their musical life-span. Every artist who has ever “made it” started somewhere where they were playing for small crowds of just their friends. So, I challenge you go to a local show, listen to the radio or visit musicalfamilytree.com to find local musicians whose music you enjoy, and become a fan. And when I say fan, I mean buy their albums, follow them on social media, tell your friends, buy their merch, and go to their shows. Even just one artist. Because I promise you, when you begin dedicating even the smallest bit of energy into seeking out great local music, you’ll be inspired by and proud of the incredibly talented musicians who call this city home. Musical Family Tree is a 501(c)3 nonprofit organization with the mission of Spreading Indiana Music. By serving Indiana’s music communities, MFT aims to help build a more sustainable and world-recognized music scene in Indiana. We accomplish this by preserving, documenting, and promoting Indiana music, past and present. In September 1998, on his last night on our farm, my father slept in the same room in which he’d been born in January 1915. To us and to our neighbors, that was not remarkable. However, when it somehow came up in conversation when I was a student at IU, that my father was sleeping in his birth place, my city friends thought I was making a joke or telling a lie. Their skepticism made me reflect on just how grounded we were in our farm and served as the germination of a life of writing poetry. We were farmers, set apart from the rest of society. Our lives were stable, yet much more complex than the casual passerby would ever imagine. I received an Individual Artist Program grant from the Indiana Arts Commission in 2015 to write new poetry, visit schools, and produce a CD. I titled it Home: Stories of a Childhood Told in Poems. I chose Home because it summarized the poems’ topics and I felt a kinship with the 2016 Spirit & Place theme. Some of the poems in Home are new; others, years ago, resonated with very diverse audiences. I was told that, in spite of ethnic, racial, and/or geographic differences, my poems about my home reflected their own. On my last day on our farm, loading that final truckload of treasures, including a gigantic cast-iron butchering kettle I am still trying to figure out what I will do with, I stood with my camera, moving slowly in a circle, shooting what became a panorama that captures the quiet farmhouse, the distant barn, the creek, and the October trees barren of leaves. I had it made into one of my large-format posters with an accompanying poem describing two childhoods there: my father’s and mine, different, yet so very similar. Though I have been to Jay County many times since then, I cannot drive by the farm. No longer do I crest the hill to the west, looking suddenly on the white farmhouse in the distance, made golden by evening light, with the expectation of good food, hugs, conversation, and, one hoped, gossip. For what is home without the occupants who made it so? No matter where I lived in the U.S. or overseas, I often wrote poems about that farm. It remains such a part of me. That’s why I cannot bear to see it, devoid of the loving parents, the laughter, my strong attachment to every tree and fence post, the corn to the west, the soybeans to the south. While preparing the Spirit & Place website with book, film, music, and other suggestions related to HOME, I was struck with how the notion of “returning home” is both ancient and contemporary. The original and ultimate “I just want to go home” tale, Homer’s classic The Odyssey, recounts the efforts of Odysseus (aka Ulysses) as he fights to make his way back home to Ithaca after the Trojan War. The Odyssey (and its prequel, The Illiad) resonates so strongly with the human condition, it has inspired artists, composers, and writers for almost three thousand years. Then, of course, there is the childhood story that taught us all, “There is no place like home,” L. Frank Baum’s The Wonderful Wizard of Oz. Like Odysseus, Dorothy struggles to make her way home and in the process faces danger, moral dilemmas, flying monkeys, and witches. Okay, Odysseus didn’t meet any flying monkeys, but he did outfox the witch Circe. The struggle to figure out where we belong and to put down roots, while also not wanting to turn down opportunities for travel and new experiences, pulls at many of us. Odysseus, Dorothy, and George Webber certainly felt that tug. I find satisfaction in knowing this tug-of-war on our sense of belonging—our sense of home—is old and even common to the human experience. And I find even more satisfaction in exploring the art and literature that has been created out of this experience. Check out our reference page and share your suggestions on HOME-related books, films, plays, music, or whatever (!) at festival@iupui.edu. Win Blevins is an award-winning writer and dedicated follower of his dreams. He’s also my Dad, and in 1994, he said three words to me that changed everything. Twenty years ago, my family was living in an old dairy farm that had been transformed into a church just north of Pittsburgh, PA. We lived in the old milk house, spent hours swinging on the porch, petting bunnies and discovering fairy rings in the woods. But while the environment appeared peaceful, my insides were roiling with the mismatch between who I was and who I wanted to become. 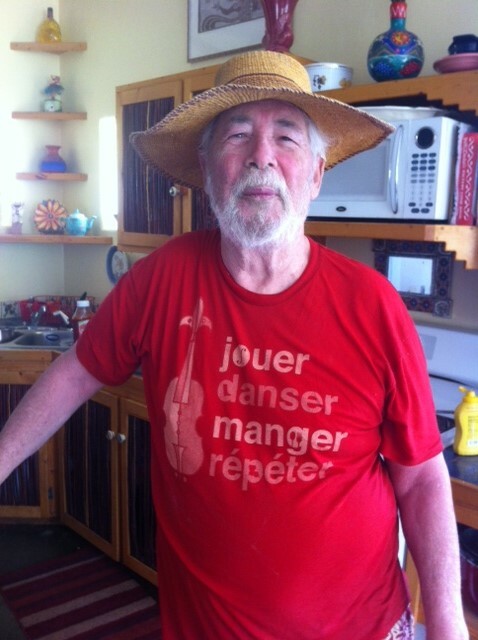 Win’s shirt translated from French means play, dance, eat, repeat. Plan for miracles? That was a head-scratcher. Can you plan for a miracle? A miracle is something inexplicably wonderful and surprising, perhaps even divine. But you can’t count on them; you can’t build them into your plan. Or can you? Many of my prayers on that stick were about making music. That simple intention started a steady stream of answered prayers. It got me directing and producing, improvising and chanting, composing and arranging, and it introduced me to countless artists, musicians, poets, dancers, and people of faith whose creativity and spirituality are inseparable. Miraculous? Oh, yeah. Naming and claiming your dream—whether you call it a prayer, a vision, or an intention—is a powerful and prophetic act. Twenty-one years later, that prayer stick still calls me to make music and calls me out when I don’t. And it reminds me, again and again, to plan for miracles. Pam Blevins Hinkle is a musician and director of Spirit & Place, which celebrates the theme of DREAM during it’s annual festival from November 6-15, 2015. Pam recently received the IUPUI Inspirational Woman Award in the staff category. Pam’s father Win Blevins is an award-winning author of more than 30 books and is the 2015 recipient of the Owen Wister Award for Lifetime Contributions to Western Literature. The award is given by Western Writers of America as its highest honor.